PDT is increasingly being recognized as an attractive alternative treatment for various cancers. PDT requires a photosensitizing drug, light of a specific wavelength, and oxygen. Upon absorption of photons, the drug generates toxic singlet oxygen species that react with nearby lipids, proteins, and nucleic acids. The primary role of PDT is to kill cancer cells by inducing immune response, apoptosis, or necrosis). This relatively new therapy has attracted extensive clinical and research interest in the last ten years, and various new PDT drugs have entered clinical trials worldwide, including studies in head and neck, lung, brain, breast, liver, colon, and bladder cancers. The first-generation photosensitizing drug Photofrin® is US-FDA approved for PDT in human cancer patients. Using the FDA-approved drug, preliminary PDT studies in head and neck cancer show that patients with early stage cancers or early recurrences in the oral cavity and larynx tend to have an excellent response to PDT. PDT can be an effective alternative treatment for a select patient population with recurrent head and neck cancer that is refractory to standard local approaches. However, the FDA-approved drug, Photofrin, has several limitations including skin burns, its short absorption wavelength, and serious side effects, which argues for the need to develop better tolerated approaches. Focal therapy is an emerging treatment modality for clinically localized prostate cancer. Instead of treating the whole prostate, such as radical prostatectomy and external beam radiation therapy, focal therapy is to treat the localized, low-risk tumor lesions with the aims of reducing mortality, reducing side effects, reducing treatment costs, and improving the quality of life of prostate cancer patients. With advanced imaging guidance and mechanically-assisted device, there is a dramatically increasing interest among clinicians and investigators for focal therapy of prostate cancer. Image-guided Focal Therapy of Prostate Cancer. One in six men will be diagnosed with cancer of the prostate during their lifetime. Systematic transrectal ultrasound (TRUS)-guided prostate biopsy is considered the standard method for prostate cancer detection. Current biopsy techniques have a significant sampling error and a low sensitivity (27%-54%) and can miss up to 30% of cancers. As a result, a patient may have a “negative” biopsy but may, in fact, be harboring an occult cancer. Alternatively, a diagnosis of cancer may have been made, but the patient is under-staged because the most aggressive histologic region of the tumor has not been sampled. Because of these limitations, patient management may not be optimized. In many men, current diagnostics are insufficient to distinguish aggressive prostate cancer, which requires treatment, from the non-aggressive disease, which may be well-managed with active surveillance. In an era of focal therapy/prostate sparing treatments for small volume prostate cancer, it is imperative to be able to precisely sample the treated area to detect whether the treatment was effective. To improve the cancer detection rate from the current standard of care practice with an initial prostate biopsy, the development of new targeted biopsy technology is an active research area. MR/ultrasound fusion guided biopsy represents one approach. It has been reported that MR/TRUS fusion biopsy detects more cancer per core than standard 12-core TRUS biopsy. 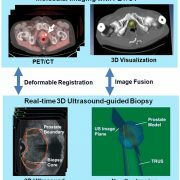 The use of three-dimensional (3D) tracking and image fusion has the potential to improve current methods for diagnosis and follow-up of prostate cancer. Positron emission tomography (PET) can detect metabolic and functional information of cancer. PET imaging agents have been developed for prostate cancer detection and staging. PET imaging with new molecular imaging tracers has shown promising results for detecting and localizing prostate cancer in humans. PET/CT may show focal uptake at the tumor and thus can provide location information to direct targeted biopsy of the prostate. 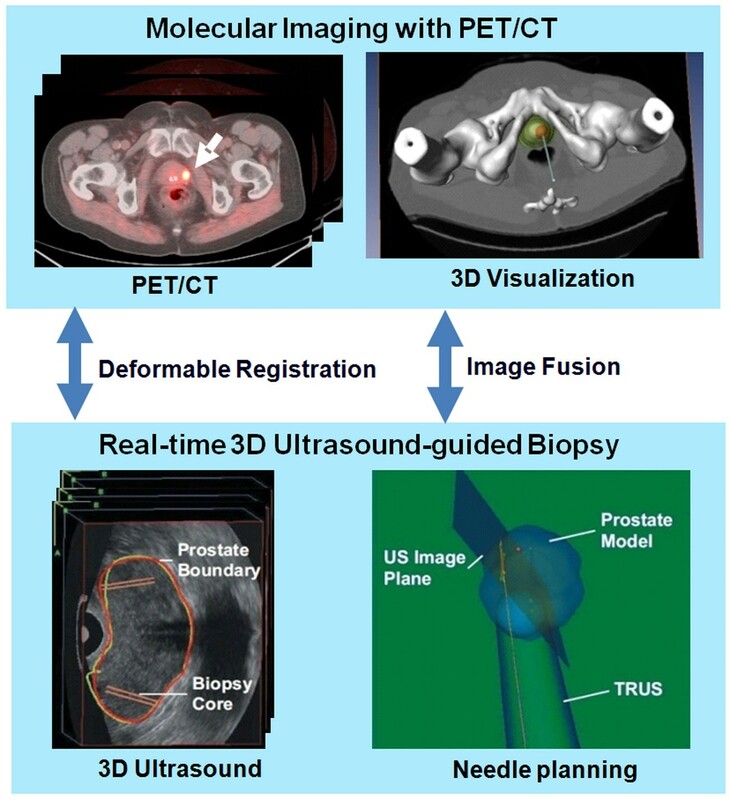 By combining PET/CT with 3D ultrasound images, multimodality image-guided targeted biopsy has become a promising technology for improved detection and diagnosis of prostate cancer. Molecular image-directed, 3D ultrasound-guided biopsy. Top: The PET/CT images with 18F-FACBC were acquired from a prostate patient. PET/CT images show a focal lesion within the prostate (white arrow). The 3D visualization of the pelvis and the prostate can be used to aid the insertion of the biopsy needle into a suspicious tumor target. Bottom: During biopsy, a mechanically assisted navigation device was used to acquire 3D TRUS images from patients. 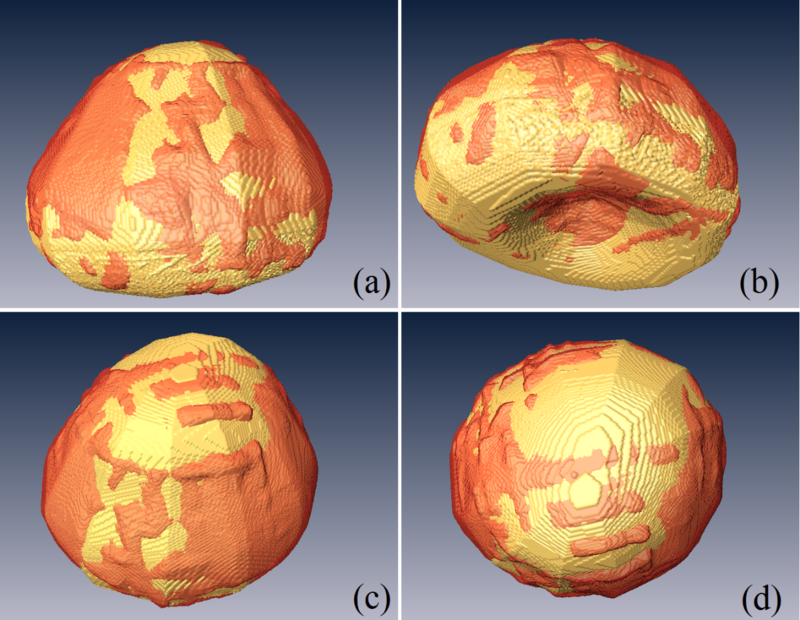 The prostate boundaries on TRUS images were segmented and were used to generate a 3D model of the prostate. The 3D prostate model and real-time TRUS images are used to guide the biopsy in patients. Three-dimensional visualization of the segmented prostate (red) as compared to the manual gold standard (gold color) in four different views (a-d) of the same human prostate.